After being shut out of the individual titles in the last two major junior events, China’s pairs have locked up two and, led by Huang Dongping, are poised to sweep the doubles at the Asian Junior Championships in Kota Kinabalu, Malaysia. For the third time in a decade, Kota Kinabalu, in the Malaysian Borneo province of Sabah, is playing host to a collection of top badminton stars. Unlike the 2003 Malaysia Open and the 2008 Superseries Finals, however, this week’s occasion involves the stars of tomorrow. In Gimcheon in 2012, China came in with a team full of young giants and very dangerous-looking talents but it was clear from the results that skipping the 2011 World Juniors and China’s general avoidance of international junior competition was taking its toll on their competitiveness. The past year has been a completely different story, however. 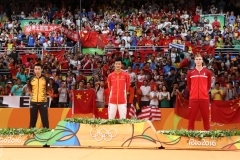 While the developing junior circuit in Asia and Europe long favoured by the Malaysians, Koreans, and Indonesians have still been absent Chinese contingents, China has fielded young teams at the Indonesia and Australian Grand Prix Golds and the New Zealand Grand Prix, as well as sending one junior to the Australian Youth Olympic Festival. This experience has clearly paid off. China’s young doubles players have clearly come into their own both here in Sabah and across the Pacific, where this year’s graduates from junior have been shaking up the U.S. Open field. Leading the way is Huang Dongping (pictured above). 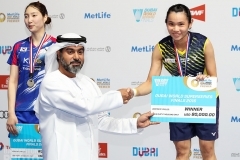 Last year, it took Korea’s eventual gold medallists to beat her in mixed and girls’ doubles but this year, she has already taken care of the girls’ doubles top seeds, Hanoi International winners Narissapat Lam / Puttita Supajirakul (pictured) of Thailand. Nor will Huang have to face a Korean pair in the girls’ doubles final again, let alone a World Junior Champion pair. Korea’s best, Chae Yoo Jung / Kim Ji Won, were beaten in three games by Chen Qingchen / He Jiaxin, who thus set up one of two all-Chinese finals. 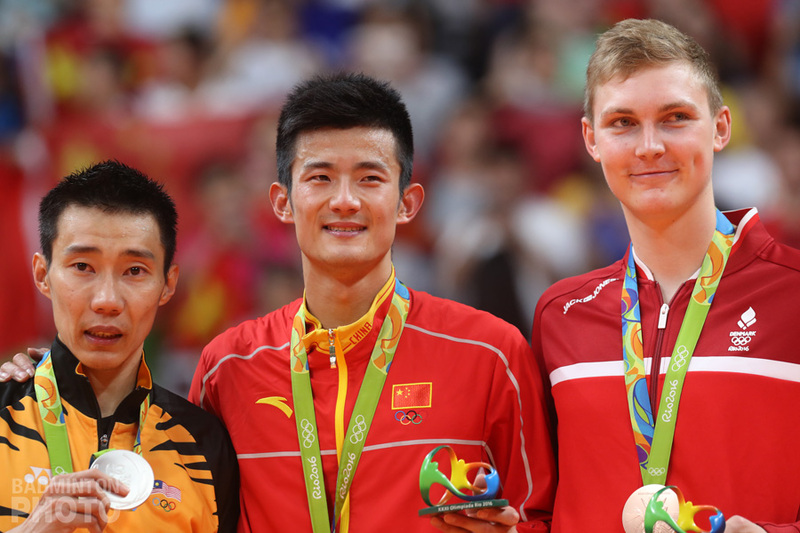 The other all-China affair comes in the boys’ doubles. 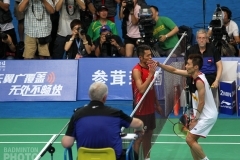 The lone non-Chinese entry in the semi-finals was none other than defending champion Arya Maulana Aldiartama of Indonesia and new partner Kevin Sanjaya Sukamuljo. 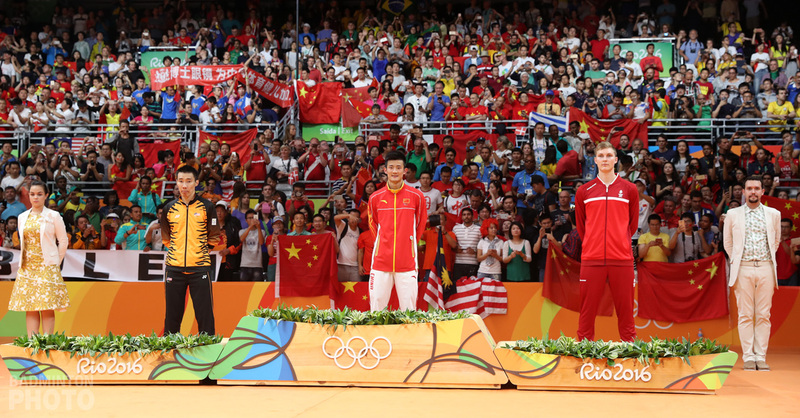 They had the misfortune of having to take on the twin towers Li Junhui / Liu Yuchen, the New Zealand Open runners-up, and they went down tamely in two games. The next task for Huang Dongping is to take out the mixed doubles defending champions, to whom she lost by the narrowest of margins last summer. This time, she will be helped by Liu Yuchen, the other double-finalist on Sunday. Korea’s mixed doubles top seeds, though they will be looking to deny Huang Dongping her shot at payback, already got a little of their own in the semi-finals. Choi Sol Kyu and Chae Yoo Jung (pictured above), had opened the mixed team final on Tuesday with a loss to China’s Huang Kaixiang / Chen Qingchen. The Koreans dropped their first game to the Chinese challengers but pulled it together for the next two to book their spot in the Asian Junior Championship final for the second straight year. Choi and Chae were not alone in the revenge department, however. Their compatriot Jeon Hyuk Jin, too, was able to put the past behind him. It was Wang Tzu Wei who had beaten the Korean in two close games of 22-20 last July in front of Jeon’s home crowd. This time, things looked like they might repeat but it was Jeon who pulled out the first game win 22-20 before going on to win 21-18 in the second. While Jeon will be the first Korean in an Asian Junior boys’ singles final since 2008, that last occasion was the only time in the last 7 years that the final was without a Malaysian player and this year’s representative Soo Teck Zhi, who overcame Thailand Open semi-finalist Thammasin Sittikom in two quick games. While China’s two top girls’ singles shuttlers distinguished themselves well in this tournament, it is clear that Japan and Thailand will have the girls to beat in this year’s junior tournaments. Even though Thailand was without 3-time World Junior Champion Ratchanok Intanon and Japan without both 2012 World Junior Championship finalists Nozomi Okuhara and Akane Yamaguchi, they still ended up ruling the final. Former Malaysian Grand Prix Gold Busanan Ongbamrungphan (pictured above) saw off China’s He Bingjiao, who was fresh off a 3-game win in the battle of the reigning Asian Under-17 Champion, He, and Under-15 Champion, Busanan’s compatriot Chochuwong Pornpawee . Meanwhile, Japan’s Aya Ohori (pictured) dispatched Australian Youth Olympic Festival winner Qin Jingjing in two straight. 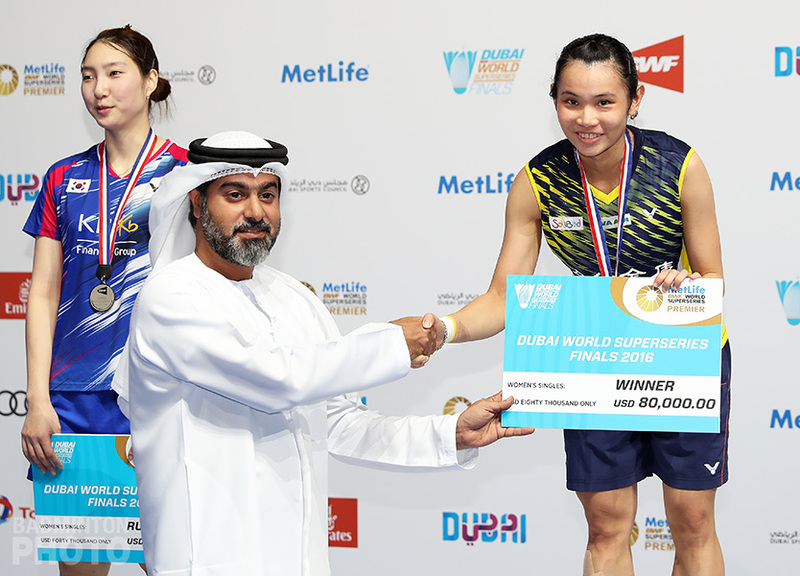 The final will be the first meeting of Ohori and Ongbamrungphan since last year’s World Junior Championships, when Ohori used the home court to her advantage to upset the favoured Thai.